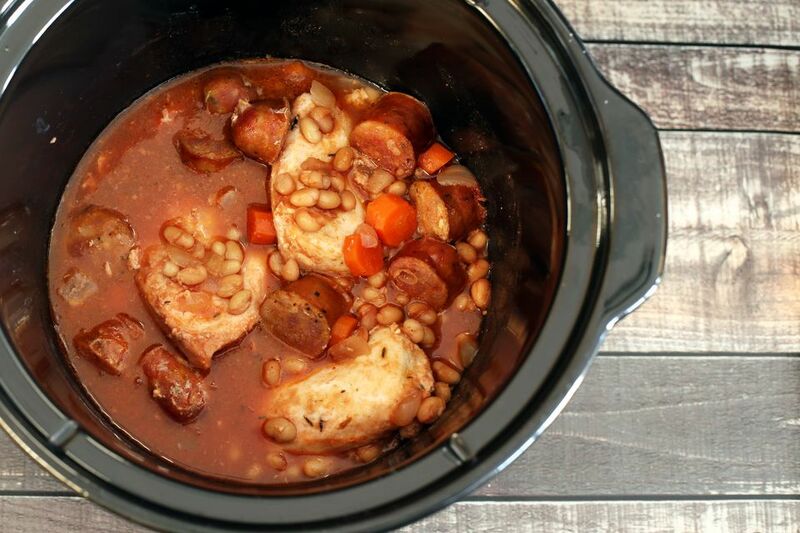 Chicken is slow cooked with smoked sausage, beans, carrots, onions, and more. Feel free to make this tasty chicken dish with andouille sausage or chicken sausage instead of kielbasa. This is a hearty, satisfying dish with plenty of great flavors. Serve the dish with rice, if desired. In a small saucepan, bring the sliced carrots, onions, and broth or water to a boil. cover the pan and simmer for 5 minutes. Transfer to 3 1/2 to 4-quart crock pot. In a bowl, combine the tomato paste with the wine, garlic powder, thyme, cloves, and the bay leaf, if using; add beans and stir to blend. Add the bean mixture to the slow cooker. Place the chicken breasts on top of the seasoned bean mixture. Place sausage pieces on top of the chicken. Cover and cook on low for 6 to 8 hours or on high for 3 to 4 hours. Before serving, remove the bay leaf. Serve as a stew with crusty bread or cornbread or serve it over hot cooked rice.